A growing majority of Seattle residents, facing a relentless rise in housing costs, are demanding real solutions from city leaders. However, with the real estate lobby dominating politics in City Hall, support is growing for left independent challenges to the Democratic Party establishment. The potential now exists for uniting Seattle’s “new left” around bold socialist demands to transform Seattle’s market-driven housing disaster. For big developers, real estate investors, and wealthy landlords, things have never been better in Seattle. Rents have climbed 57% in six years. Renters now pay an average of $635/month more to landlords, a huge upward transfer of wealth. Meanwhile the median home price has doubled in five years, now averaging over $700,000. Working and middle class people, especially in communities of color, are being systematically pushed out of the city or facing dramatic cuts to their living standards. Homelessness is skyrocketing, with large tent encampments crowding into all available green spaces even as huge cranes tower overhead to construct high-rise luxury apartments. In the last year alone, police have carried out over 600 brutal sweeps of these homeless encampments, disrupting the increasing efforts toward self-organization and neighborhood solidarity being built up in them. Meanwhile Seattle’s political establishment, backed and funded by big developers and big business, is doubling down on failed market-driven “solutions” to incentivize more private, for-profit development. Just days before deciding to enter the mayoral race, the leading Democratic Party contender, Jenny Durkin, “had a meeting with business leaders … hosted by Allen’s real-estate firm Vulcan,” Seattle’s most influential big developer (Seattle Times, 5/11/17). Incentivized by city policy, Vulcan and other developers are set to open almost 10,000 new apartments in 2017, “nearly twice as many as in any other year in [Seattle’s] history” (Seattle Times, 12/30/16). Unfortunately expanding supply alone will offer little relief to renters since the biggest profits come from constructing high-end condos and luxury apartments, and often involves the removal of existing affordable housing. Seattle is a booming city, flush with tech-industry profits. There is no reason anyone should be homeless or spending half their income on housing. The total failure of capitalism to meet basic housing needs calls for bold socialist policies to cut across market forces and dramatically increase the supply of quality, public affordable housing and freeze out-of-control rent hikes. Build tens of thousands of quality public housing units paid for by taxing big business. Seattle needs rent control as an emergency measure to address the crisis of out-of-control rent hikes. Require 25% of all newly developed housing be affordable. Dubbed the representatives of “Seattle’s New Left,” Sawant, Oliver, Grant and Socialist Alternative will use the city election battle to build popular support for these demands. So far, none of the Democratic Party’s candidates are supporting these policies, despite popular support among rank-and-file Democrats in Seattle. However, much like Seattle’s victorious $15 minimum wage fight – which at first was only backed by Sawant and Socialist Alternative – if Seattle’s new left can build a real movement from below around these demands, major victories are possible. Of course, skyrocketing rents and home prices are not unique to Seattle. Real estate speculation and big developers are fueling a housing crisis in most major cities across the country, and in many globally. Like in the fight for $15, where the early victory in Seattle helped propel the $15 movement and Socialist Alternative to national prominence, the potential exists for Seattle to transform the national debate again. 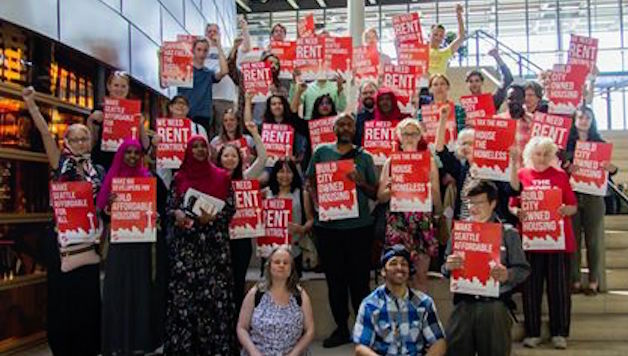 A major victory on any of these three demands, especially if led by Socialist Alternative and the wider Seattle left, could help inspire a much-needed movement to create a public alternative to the failed capitalist housing market.